Recommended to: Readers who have loved this series and are waiting to see what happens! Where do I start? I've been following the Hourglass series fanatically since book one. I've fallen in love with the characters, been enchanted by the story, and always looked forward to more. Needless to say that it was a bittersweet moment when I turned the last page of Infinityglass. I felt satisfied, but sad that it was time to say goodbye. This particular book focuses mainly on Dune and a newcomer to the group, Hallie. I loved that Dune was in the spotlight this time around. He's slightly awkward, and sweet in a way that makes you want to wrap him up in a great big hug. Best of all, he's a gentleman. Isn't that so hard to find these days? Then there's Hallie, who is his utter opposite. Feisty and impulsive, she makes Dune crazy. It's hard enough to protect an object, but to protect a person? Suffice it to say that it makes things interesting. Now I'm going to be as vague as possible here for those who haven't gotten to this yet (you won't get any spoilers from me), but Infinityglass ties everything together. Every event that has happened so far culminates into something unbelievable and yet amazing. I couldn't look away. Questions I had were answered, the best (and worst) selves of characters were revealed, and I ended the book with a sense of completion. Infinityglass is an excellent example of what the last book in a series should be. McEntire wrapped everything up in a pretty red bow, and I eagerly accepted it. Apologies for the vague review, but I hope it's obvious that I enjoyed this book! I just want to give other readers out there the opportunity to enjoy it as much as I did. 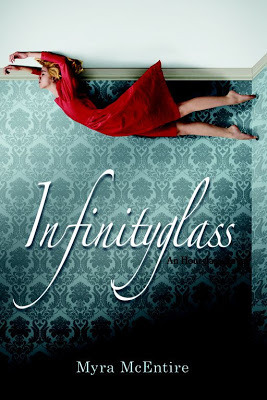 If you're a fan of the Hourglass series, if you've been following these characters as maniacally as I have, Infinityglass is a must read. Enjoy the journey!